Introducing ErucA, Japanese hair care brand of botanical oil infused shampoos and conditioners. ErucA, the focus has been on seed oils, providing nature’s ‘silicon-like’ effects but without the harmful effects of silicon itself. Seed oils from broccoli, cowberry, bilberry, milk thistle, etc is the hallmark of this moisturizing and shine-inducing formula, while the blend also contains other rich botanically-sourced oils such as argan, virgin prune and marula oil, which helps rejuvenate tired tresses. 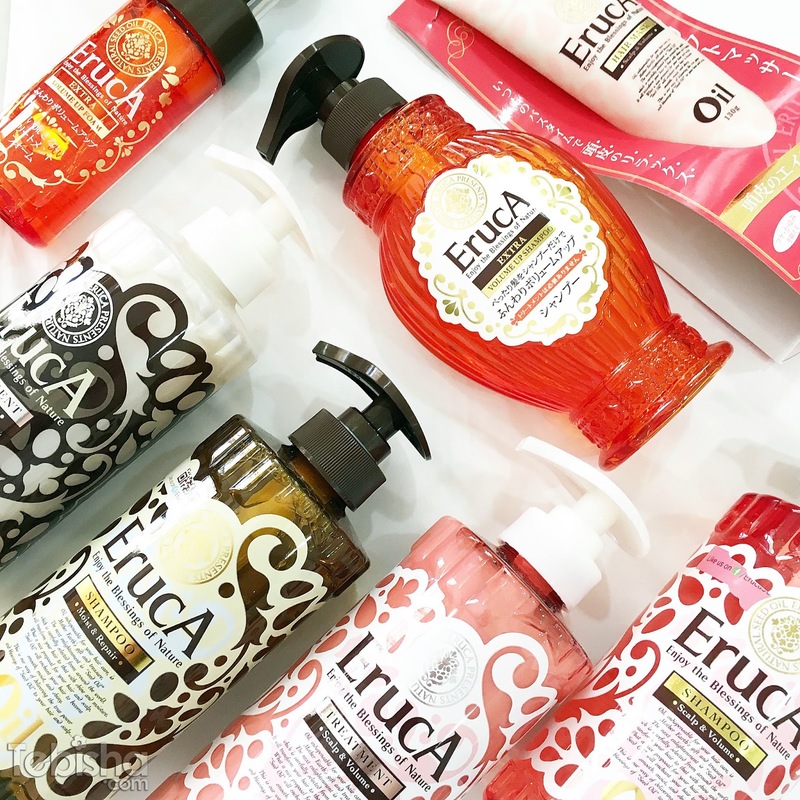 ErucA has 3 different hair care collections to cater different users and hair types. Extra Volume Up collection wraps the whole hair in a thin veil to create volume from the roots without the use of harmful hair products! Both All-In-One Shampoo and Volume Up Foam contain a unique silicon-free formula, which cares for your hair and scalp. The moisturizing botanical oil extracted from broccoli seed and cranberry seed cleanse and clarify your hair without stripping essential oils from your scalp. Moist & Repair collection restore water and oil balance in your hair and scalp for frizz-free hair. Tame your unruly hair into beautiful lock of hair with the brand new Eruca Moist and Repair. The luxurious argan oil, virgin prune oil and marula oil help to make your hair more manageable while being gentle enough so as not to strip excessive natural oil from your hair. Scalp & Volume collection repair the scalp and alleviate common scalp problems like itchiness and dandruff. Botanical oil extracted from specially selected seed oils help to restore balance to your scalp. Moisturizing ingredients like hyaluronic acid repair the scalp and alleviate common scalp problems like itchiness and dandruff. The all-natural botanical oil extracted from cowberry seeds and bilberry seeds also help to revive and restore your hair and scalp to their healthy stage! Anti- aging scalp care which moisturizes scalp and repairs damaged hair. Contains rare oils, which allows the smooth texture of the mask to be absorbed smoothly into the scalp. Moisturizes with 18 natural oils and repairs hair damage. Examples of 18 kinds of oils- Jojoba seed oil, shea oil, olive oil, avocado oil, akebisol, etc. My Reviews: Among the 3 collections, Scalp & Volume collection is best suitable for my scalp condition and hair type. I have a very sensitive scalp, if I used an unsuitable hair products, I will have scalp problems like itchiness, flakes and redness. Scalp & Volume collection doesn’t give me any scalp problems, it helps to sooth my scalp and gives me a healthy-looking hair after washed and blow dry. In the market, most dandruff shampoos gives an awful or minty smell but ErucA hair care collections’ formulas have exquisite flower fragrances which makes our hair smell great after washed. If you don’t have sensitive scalp like me, you can try out the other 2 collections Extra Volume Up or Moist & Repair. Extra Volume Up: Hair volumizing ingredient remains at the roots and lifts the hair. Moist & Repair: Repair component works from the inside out to repair damage while internally moisturizing each follicle. They have ongoing contests for Christmas, CNY & thereafter (They have weekly contests)!